The band then quickly set to work on writing more songs for a follow-up. 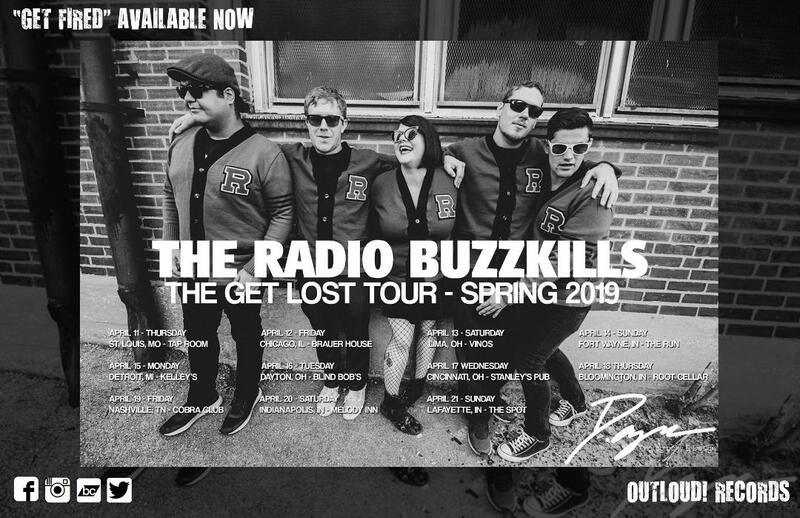 With a fast work ethic and songs honed while on the road, their new album ‘Get Lost’ is set for release early this year. And, indeed, early indications are that ‘Get Lost’ will be a side-step from the previous record. One of the key tracks, ‘She Hails Satan’ mixes classic pop punk with the kind of Frankie Valli and soda bar influences beloved by the Ramones, but hits the listener with a harmony filled chorus where Jenny’s vocals really give the Buzzkills a different dimension to their earlier recordings. In contrast, ‘Tattletale’ is far closer to a Screeching Weasel homage than the band have recorded previously, right down to its sneering lyric. Zac is keen to point out that ‘Get Lost’ isn’t, by any means, ‘Get Fired! Vol 2. ‘Get Lost’ is released via Outloud Records in the Spring. This entry was posted in News and tagged new album, pop punk, punk, st louis, the radio buzzkills, tour dates by Real Gone. Bookmark the permalink.